No matter what your project is - launching is a lot of work. With so many moving parts, you’re feeling overwhelmed, confused and in over your head. The good news? You don’t have to feel this way! It’s time to stop spending so much time trying to make it all look as awesome as you want and hand it over to someone who knows exactly what to do. but converts more visitors into subscribers and clients. Custom-designed + easy to update WordPress site, including all pages you need. Add-on: Branding - what's included? Brand Strategy Session where we talk through your personality, ideal client and long-term vision for your business. This will inform the design choices throughout your project. Brand Assets that will help you stand out in your industry and attract your ideal clients. Now booking projects for May 2019 and beyond. All the promo images you need to spread the word about your offer. Add-on: Design + set up of course site on WordPress or a platform like Teachable, Thinkific or Kajabi. Add-on: Branding for your offer - what's included? It’ll look gorgeous on ALL screen sizes. I use best practices to make your site load fast. You can use the final pages as a "template", meaning you can easily duplicate and edit them, and use for future launches as well as your other offers. It was such a pleasure working with Anouska. She's responsive, thorough and is great at what she does! I LOVE my new sales page. I'm really, really proud and happy with it! I raised my price and more people joined - my revenue went up 175%! To get started with your project, book a consult call. We'll go over your goals and the look and feel you want, and make sure we're a good fit for each other. When you're ready to move ahead after the consult call, I'll send you the contract and invoice for the deposit. Once I have everything I need from you, I'll start designing. Depending on your project, I will start with your opt-in freebie and page so you can start building your waitlist and create anticipation and excitement for your program ASAP. I'll continue to design the other assets you need while you're growing an excited waitlist. 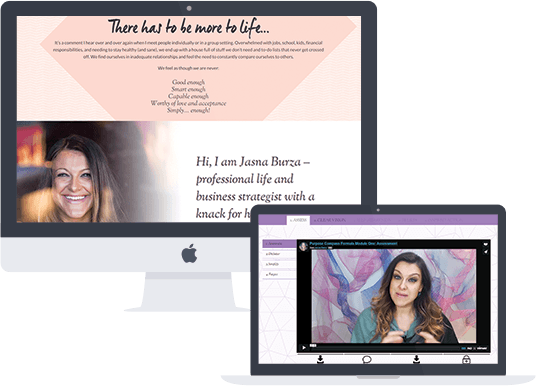 Once you're completely happy with the designs, you'll pay the final invoice and I'll move everything over to your live site and help you launch it with a splash! Sales pages and launches are a lot of work. To give my best work each time, I only take on a few projects per month. It’s best to book your project in advance to make sure it’ll be ready for your launch date. That said, I do reserve some availability at a VIP rate for clients that need a quick turn-around. If you need your sales page within a week, I might be able to do so depending on other projects I have going on. How long does my type of project take? It depends on whether or not you need new branding, how fast you respond to feedback requests, the number of pages for your website, how long your sales page copy is, and everything else you need included in your project. For sales page design with existing branding, the usual turnaround is 2-3 weeks. If you need your short sales page (under 2,500 words) within a week, I might be able to do so depending on other projects I have going on. Bigger projects (such as full branding + website design and complete course design) take 4-8 weeks from start to finish. Keep in mind you need to have all copy, testimonials, and images ready to go. Can you build my website / page(s) using _____? I don't design + develop pages for anything other than WordPress. If you don't have a Page Builder plugin yet, I will use Beaver Builder. If you have a Page Builder (Elementor, Divi, etc.) already and want to keep using it, I can do that too, but it depends on the page builder you have and how limited it is. Some (usually free) page builders are too limited. The only exception is the course site, I can set that up on WordPress or another platform, like Teachable, Thinkific or Kajabi. No, copywriting and design are two totally different specialties. There are a lot of blog posts and other resources out there that will help you write your sales page yourself, or, if you don't want to do it yourself, there are plenty of great copywriters that can help you. Contact me about it and I'll get back to you ASAP! Click the Let's Get Started button and schedule your consult call. When you're ready to move ahead after the consult call, I'll send over the contract and invoice for the deposit. Once I have everything I need from you, I'll start designing. You'll give feedback, and I will refine the designs.